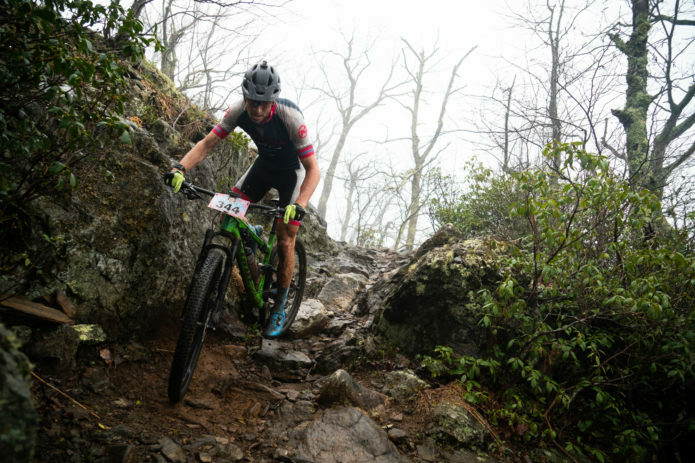 In the last four years, Kerry Werner has won the Pisgah Stage race overall twice, won the enduro category twice and finished third overall twice. After an epic cyclocross season where Kerry finished as the highest ranked UCI male athlete in the USA, he’d been taking it easy. The Pisgah consists of five epic stages raced over five days. There is over 20,000ft of climbing and racers cover around 140 miles during the event. The terrain is rugged, brutal and unforgiving and a few of the descents could easily qualify as EWS stages. After the first stage, Kerry knew he was out of touch for the win so switched his focus to finishing third and staying on the overall podium, but he also now adjusted his sights on notching up his third enduro win for the event.